Unlike southern neighbor Albay, Camarines Sur was not well known as a tourist destination. Aside from being the seat of Our Lady of Peñafrancia, Bicol’s patron saint, Camarines Sur and its main city of Naga was just a rest stop of vacationers going to Legazpi to see Mount Mayon, Donsol to see the whale sharks, or Matnog on the way to the Visayas. Camsur’s lackluster tourist status changed when the islands and beaches of the Caramoan Peninsula became a popular location for various foreign Survivor franchises, and when the famous Camsur Watersports Complex opened in the capital town of Pili back in 2006. Because of these developments, Camarines Sur has quickly established itself as the outdoor adventure capital of the Bicol Region. Camsur Watersports Complex [official website, Wikipedia], or CWC for short, is located right inside the Provincial Capitol Complex and is easily accessible by public transportation from Naga Airport and Naga City. 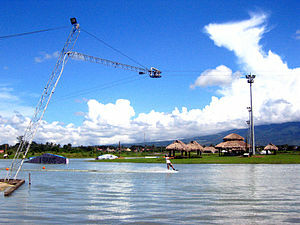 The main attraction of the park is a man-made O-shaped lagoon where most of the wakeboarding, wakeskating, kneeboarding, and waterskiing occurs. The park uses a 6-point cable system which means that boarders and skiiers are pulled, not by motorboats, but by an overhead cable system held up by six pylons arranged around the lagoon. Contrary to claims, CWC is not the first cable waterpark in the Philippines (that honor goes to Lago de Oro Resort in Batangas), but CWC is definitely the largest in the country. Owing to its size and state-of-the-art facilities, CWC has become a popular destination among international wakeboarders and has been the site of several wakeboarding competitions. For the less adventurous visitors, the park also has facilities for other, safer, activities such as sports fields and courts, making it a viable destination for families and groups of friends or co-workers. Other watersports activities can also be done at the adjacent Lago del Rey, another man-made lagoon to the southwest of cable park. CWC also has villas for those who want to stay overnight as well as spa services for those who want to get a massage.